The Toledo women’s golf team tied a school record Sunday by capturing its fourth tournament title of season with an 11-stroke victory at the 18-team Rio Verde Invitational in Arizona. 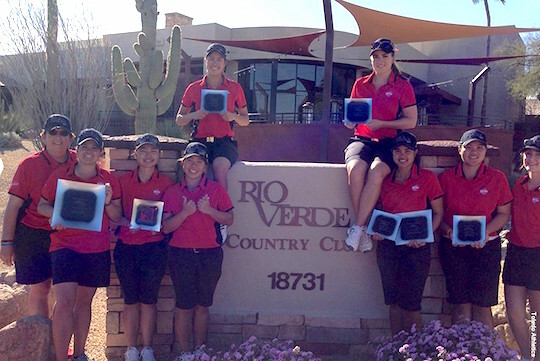 The UT women’s golf team scored an 11-stroke victory at the Rio Verde Invitational in Arizona. UT was led by top 10 finishes by the senior trio of Sathika Ruenreong, Manisa Isavas and Morgan Salm; however, it was freshman Pimchanok Kawil who paced the Rockets Sunday with an even-par 72. Ruenreong topped Toledo with a second-place showing and a two-over par 218 (74-70-74) with Isavas (72-75-74) and Salm (72-77-73) tying for sixth and eighth place, respectively, at five-over 221 and six-over 222. Kawil tied for 36th place at 12-over par 228 (82-74-72), while freshman Natcha Daengpiem placed 53rd at 16-over par 232 (80-75-77). Xavier’s Hanna Lee captured medalist honors at one-over par 217, one stroke ahead of Ruenreong. This entry was posted on Monday, February 29th, 2016 at 3:21 am and is filed under Athletics, News .